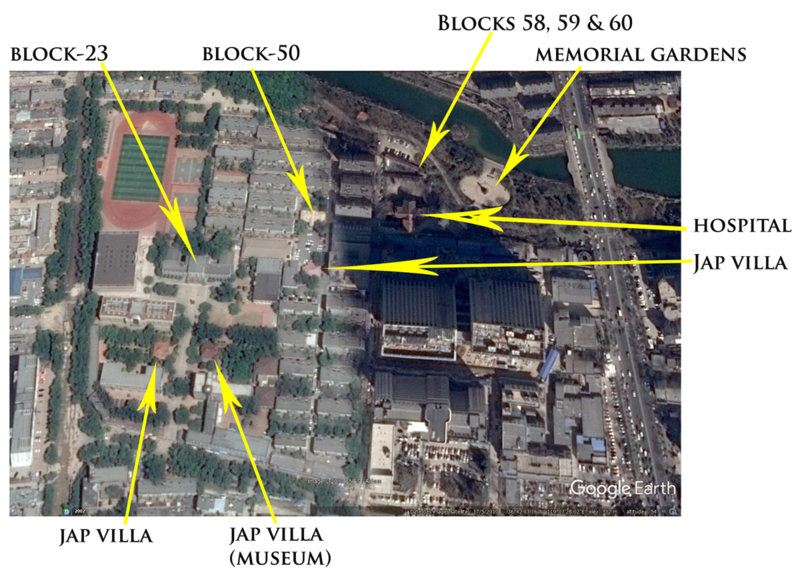 Sometime around the 60-year celebrations (2005) of the liberation of Weihsien Concentration Camp, ... maps became available from Google Earth and the new software freely available worlwide was solicitated to find Weifang and the whereabouts of our old concentration camp. 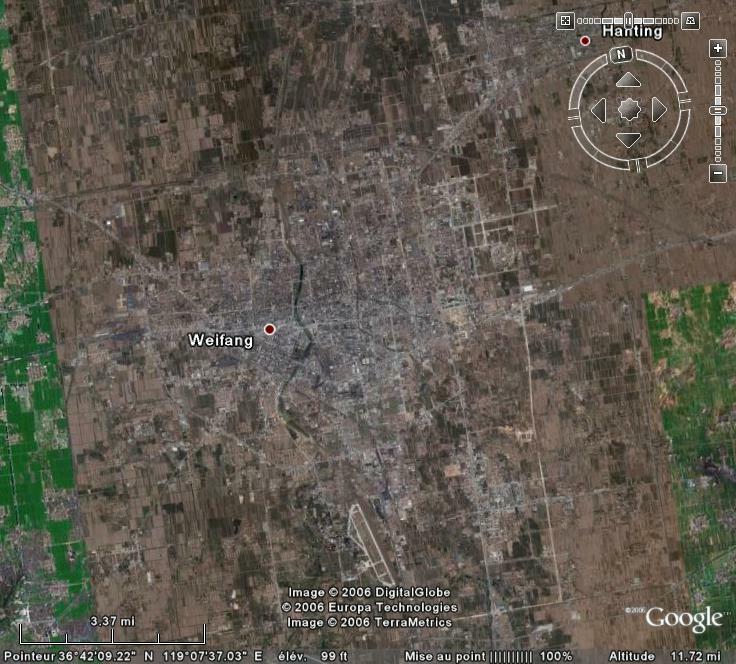 ... above photo shows a satelite view of the city of Weifang. Altitude: 12 miles. The first pictures we had - thanks to Google Earth - were somewhat blurry. 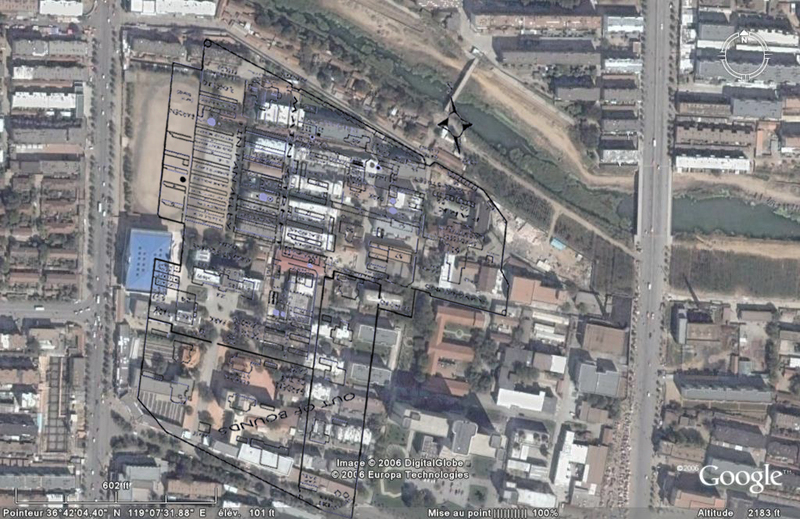 Finding the exact position of the concentration camp was quite impossible. The rooftops were a smudge of reddish color and the streets were vague lines. Impossible to find the rooftop of the compound hospital or even the big building that was once: block-23 which was an imposing landmark of our camp. 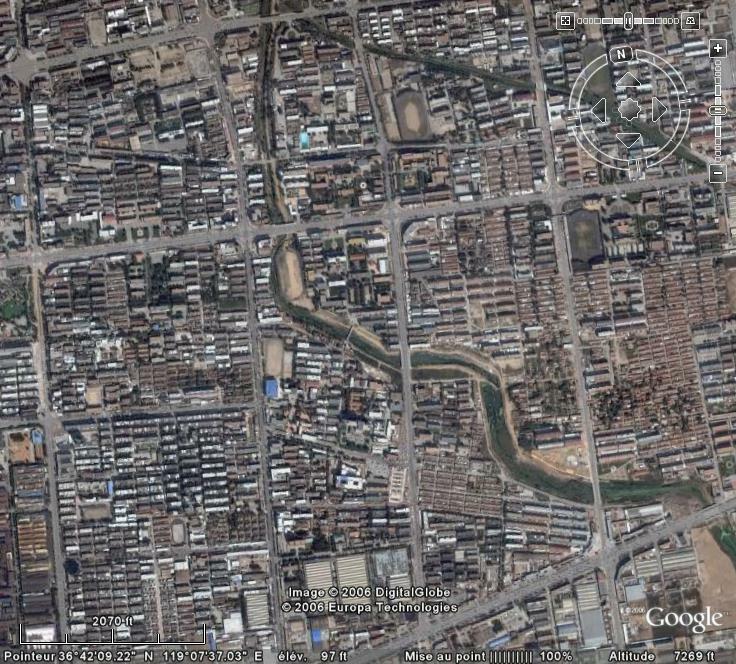 I wrote to "Google Maps" for the possibility of having a high definition picture of Weifang and I explained why I wished to have it. Beleive it or not, I got an answer. They wrote that - Yes - it was possible to have Weifang in "high definition" providing the sky was blue and that they could make a satelite pass over the city. They also told me how much it would cost for the whole operation. Of course, with my meagre budget, I declined the offer by explaining that the Weihsien-Paintings' website was non profit and free access to all. I then forgot about it altogether. 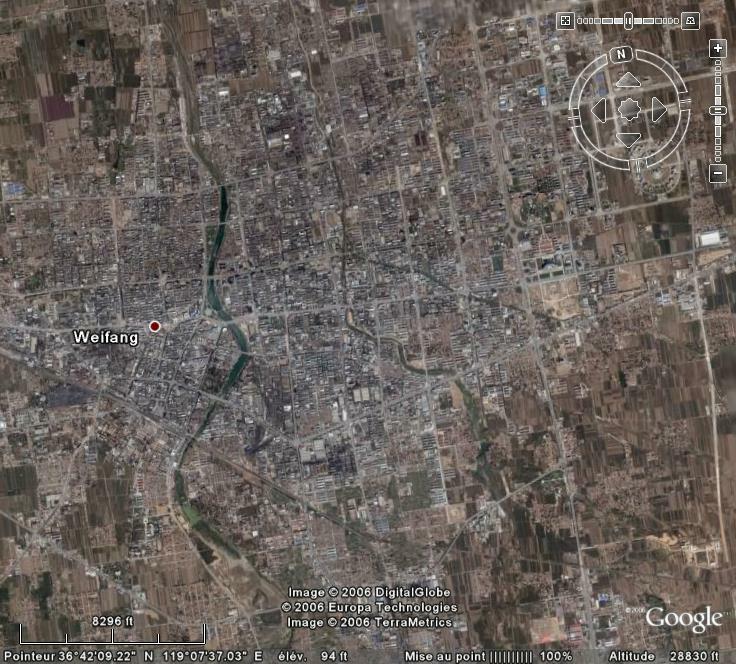 ... we now have free access to the entire city of Weifang in high definiton. 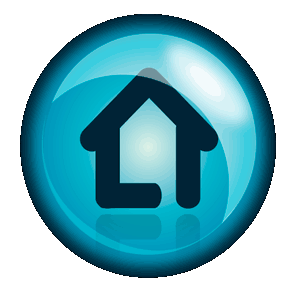 The above picture is a satelite view at: Altitude = 28830 feet. The rivers are perfectly distinguishable. This whole block (above picture) is what is left of what "was" a Presbiterian Mission transformed into a concentration camp by the Japanese and now part of an important Chinese city. It is now: N° 2 Middle School. Curious! The map seems to be wider than Father Verhoeven's sketch. Difficult to imagine that we were almost 2000 in there! I am still not sure about the scale of the various sketch maps that we have seen over the years, Given that the rooms in the hutted rows were 12 ft x 8ft 10 inches that makes each block of 12 rooms 106 feet long without any walls we know the walls were 1 1/4 bricks wide ie 12 inches and for 12 rooms there would be 13 walls giving a total block length of 119 feet ie nearly 40 yards from the scales quoted in the various books with maps the average seem to suggest that each block was only around 27 yarrds ( 80 feet) ie making each room just over 6 feet6 wide which we know is wrong. I agree with you about the likelihood that the hand-drawn versions of the Weihsien maps are likely to be a little off in scale - very understandable if you can imagine how you would do it without any surveyor's instruments. My urban planner's instincts tell me that the outer boundaries then are likely to be reflected in street patterns now, and so I have superimposed my own guess as to the locations of the perimeter walls on the attached image as red lines. Actually, that it's a tribute to the original map-makers that they got it as close to exactly right as they did. I totally agree with you I have done some playing around with a pair of dividers although not a town planner I was taught aerial reconnaissance 50 years ago and all my life have been in and out of maps and mapping. I think that the west boundary of the camp coincided with the N/S road that is now there that the south boundary ran along that road tree lined running south of east interesting how the corner cut off is the same relative shapes the Camp wall. The blocks 50 and the hospital are correctly to scale but that the scale to the NW of the camp with the long blocks was at about 80% of the rest. 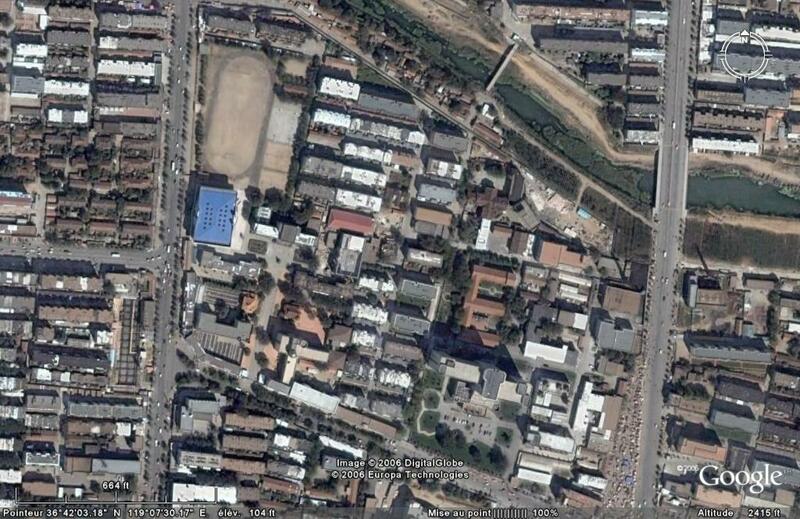 If this theory is correct the block with the Blue roof is on the site of the old Block 24 and 23. As you say town planning follows road lines and vice versa. Some of London is still defined by Roman Roads and given the situation between 1945 and 1980 it is unlikely a developer flatted the camp and id plan building development and that it is far more likely that buildings fell down or were developed individually. The other point about the sketch maps is the size of the field in the NW corner it was too small for baseball but OK for softball, that has a 30 yd diamond. I also seem to remember that when soccer football was played the penalty and goal area was combined and that the whole field was 75% of an actual official soccer field which would make it 80 yds. I think that that has been cut off when the E/W road at the intersection with the N/S road (top left of map) was cut and that "Tin Pan Alley (also known as Rocky Road) was there by the side of what now looks like a running track and that the Main Street should be were the superimposed Tin Pan Alley now is.